Surely this happens at multiple locations around Western PA during the various rush hour periods. We just happen to capture this one on the McKees Rocks bridge. You know the drill….the road has 2 lanes. One of those lanes is stacked with cars who, eventually, have to “turn only” or make some kind of commitment. The other lane eventually has the other options. So, the good peeps, take their turn in line and sit and wait for their turn to commit. Maybe they even turn on some music or, better yet, the YaJagoff Podcast. Then ya have the ones that spoil the party for everyone because of they seem to have to get to work, or their bottomless cup of coffee at McD’s faster than YOU! Or, they don’t have the ability to download the YaJagoff Podcast (which can be audio for the soul if ya let it.) 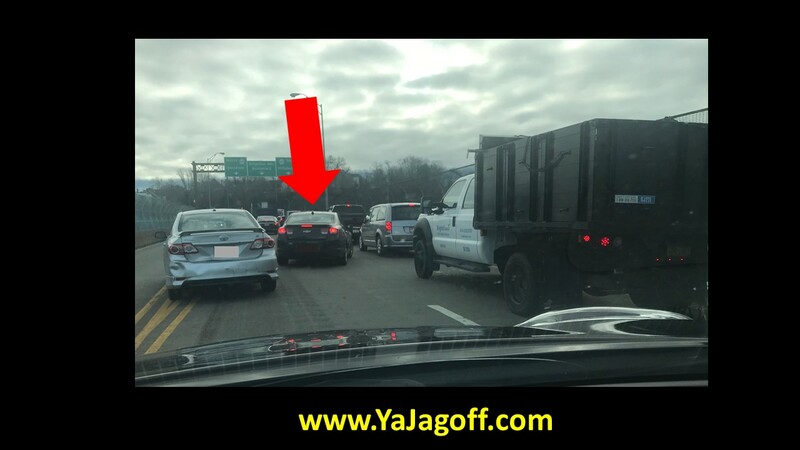 They creep up along the lane of traffic.. looking for someone not paying attention, someone that they determine might be slow on the ol’ gas pedal or someone they believe will wave them on in with a naive, “Oh you forgot to get in the back of the line? No worries, get in front of me Hon!” wave! Of course, now the non-commitment driver holds up rush hour progress in MY lane! They get a horn, a yell, a hand signal, posted on this website and, if I had day-old cupcakes and doughnuts, I’d wail THEM at the car too from my sunroof access. Hey Timmy the Traffic Jumper…. get in line and wait your damned turn or fix your hair faster, at home in the morning, and get in the traffic queue earlier! I’m coming armed, next time with the cupcakes and doughnuts. WAIT! Who am I kidding..I would NEVER waste good baked goods on your selfish driving techniques. Go to the back of the line…Ya Jagoff! Do You Like My Sandwich? One Bad Mother @#$#er on a Scooter!!!! So They Didn’t Feel the Bump?